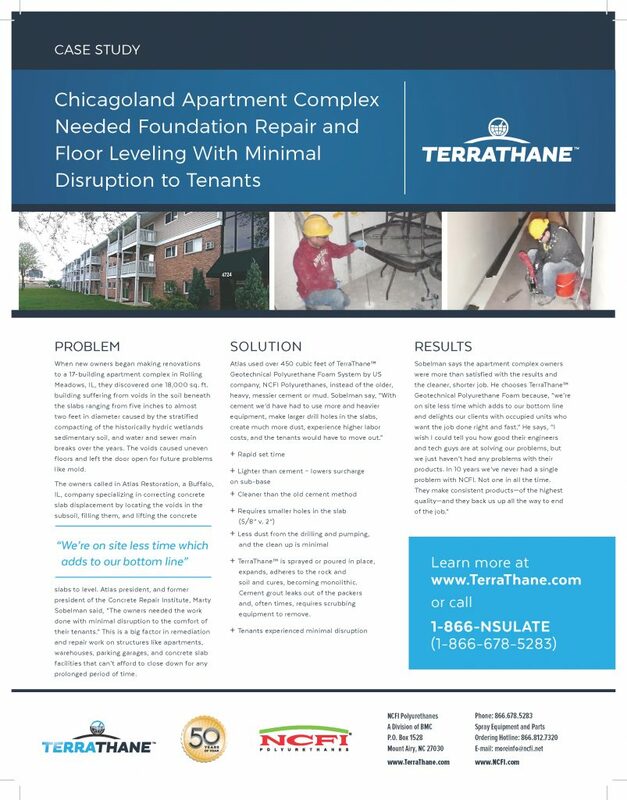 When new owners began making renovations to a 17-building apartment complex in Rolling Meadows, IL, they discovered one 18,000 sq. ft. building suffering from voids in the soil beneath the slabs ranging from five inches to almost two feet in diameter caused by the stratified compacting of the historically hydric wetlands sedimentary soil, and water and sewer main breaks over the years. The voids caused uneven floors and left the door open for future problems like mold. 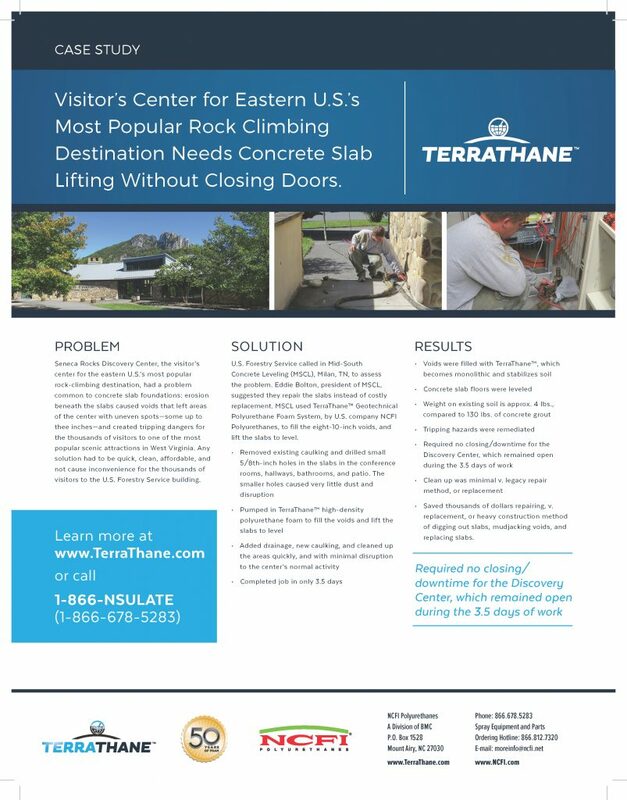 The owners called in Atlas Restoration, a Buffalo, IL, company specializing in correcting concrete slab displacement by locating the voids in the subsoil, filling them, and lifting the concrete slabs to level. 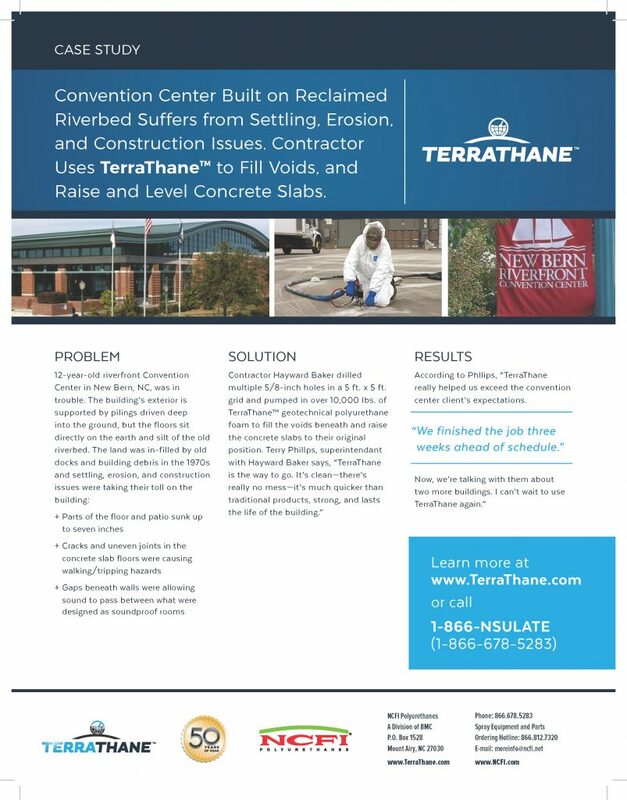 Atlas president, and former president of the Concrete Repair Institute, Marty Sobelman said, “The owners needed the work done with minimal disruption to the comfort of their tenants.” This is a big factor in remediation and repair work on structures like apartments, warehouses, parking garages, and concrete slab facilities that can’t afford to close down for any prolonged period of time. 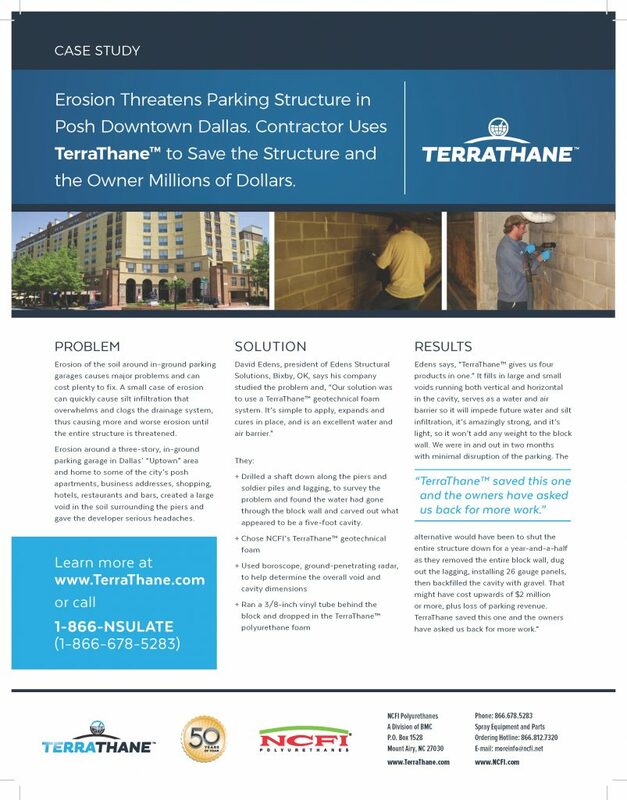 Erosion of the soil around in-ground parking garages causes major problems and can cost plenty to fix. A small case of erosion can quickly cause silt infiltration that overwhelms and clogs the drainage system, thus causing more and worse erosion until the entire structure is threatened. Erosion around a three-story, in-ground parking garage in Dallas’ “Uptown” area and home to some of the city’s posh apartments, business addresses, shopping, hotels, restaurants and bars, created a large void in the soil surrounding the piers and gave the developer serious headaches. Erosion under concrete slab highway and bridge approaches causes uneven, dangerous driving conditions. Interstates 29 and 94 near Fargo, North Dakota, were in need of repair. 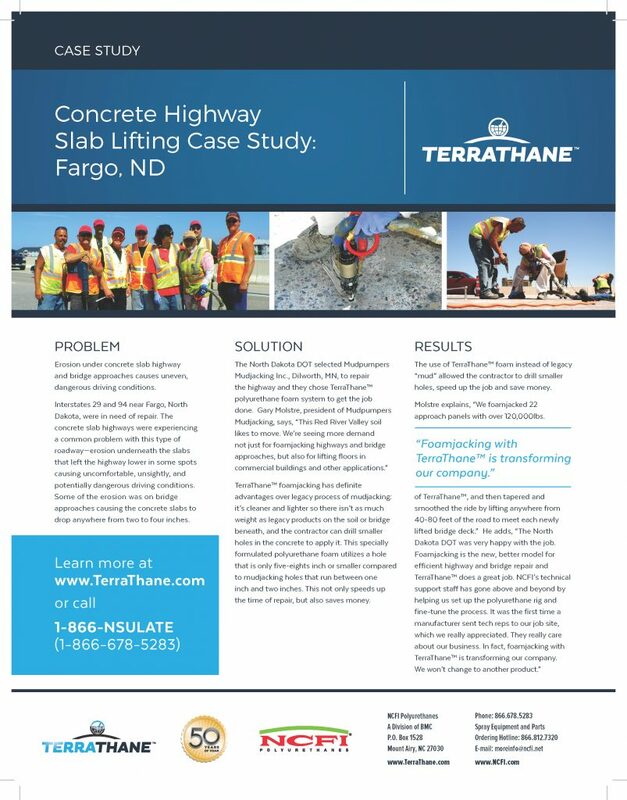 The concrete slab highways were experiencing a common problem with this type of roadway—erosion underneath the slabs that left the highway lower in some spots causing uncomfortable, unsightly, and potentially dangerous driving conditions. Some of the erosion was on bridge approaches causing the concrete slabs to drop anywhere from two to four inches. Erosion beneath the highways causes the concrete highway slabs to drop, roadway depressions, uneven bridge approaches, and uneven joints that make driving bumpy and uncomfortable, dangerous, and causes severe wear and tear on automobiles. Highways around Houston, TX are known for their traffic, only lagging behind other metropolises like Los Angeles, D.C., and Atlanta. This means the roadways need constant repair, but they also can’t be closed while the work is done. 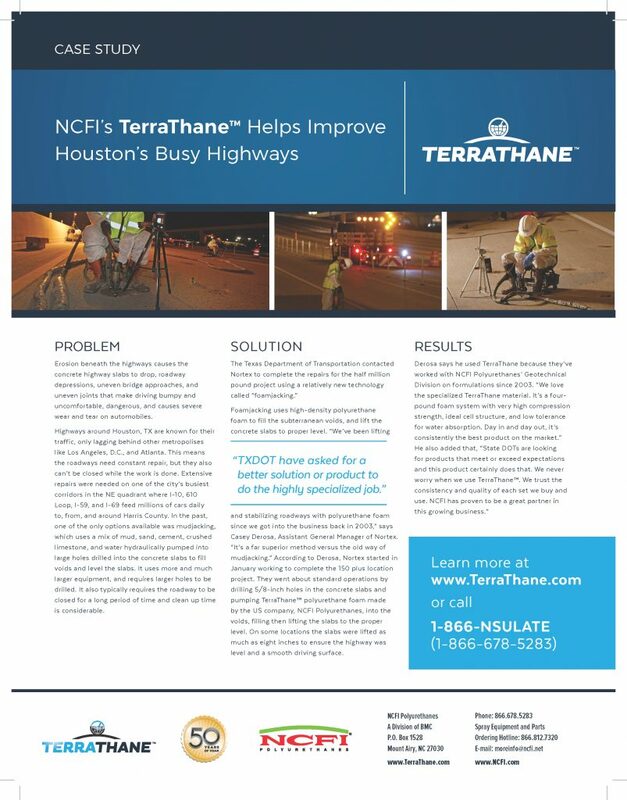 Extensive repairs were needed on one of the city’s busiest corridors in the NE quadrant where I-10, 610 Loop, I-59, and I-69 feed millions of cars daily to, from, and around Harris County. 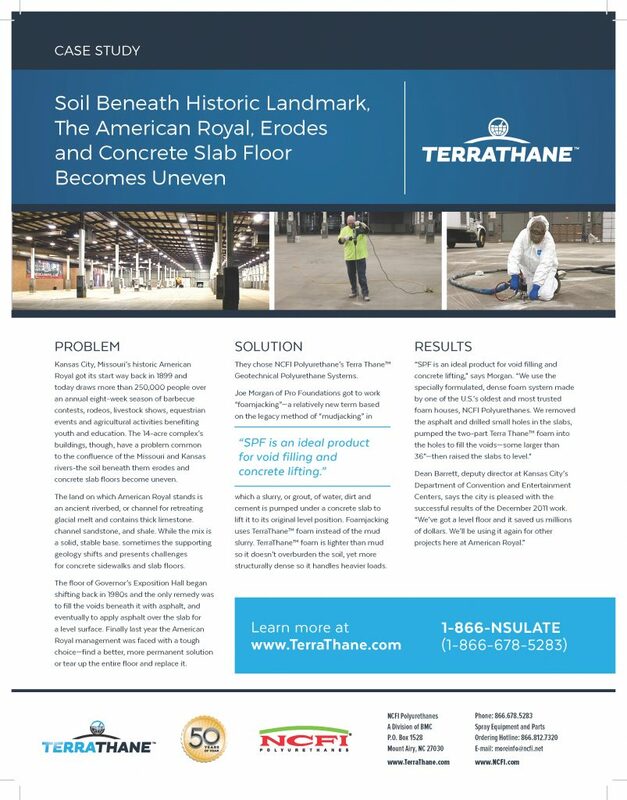 In the past, one of the only options available was mudjacking, which uses a mix of mud, sand, cement, crushed limestone, and water hydraulically pumped into large holes drilled into the concrete slabs to fill voids and level the slabs. It uses more and much larger equipment, and requires larger holes to be drilled. It also typically requires the roadway to be closed for a long period of time and clean up time is considerable. Kansas City, Missouri’s historic American Royal got its start way back in 1899 and today draws more than 250,000 people over an annual eight-week season of barbecue contests, rodeos, livestock shows, equestrian events and agricultural activities benefiting youth and education. The 14-acre complex’s buildings, though, have a problem common to the confluence of the Missouri and Kansas rivers-the soil beneath them erodes and concrete slab floors become uneven. The land on which American Royal stands is an ancient riverbed, or channel for retreating glacial melt and contains thick limestone. channel sandstone, and shale. While the mix is a solid, stable base. sometimes the supporting geology shifts and presents challenges for concrete sidewalks and slab floors. The floor of Governor’s Exposition Hall began shifting back in 1980s and the only remedy was to fill the voids beneath it with asphalt, and eventually to apply asphalt over the slab for a level surface. Finally last year the American Royal management was faced with a tough choice—find a better, more permanent solution or tear up the entire floor and replace it. Erosion beneath warehouse’s concrete slab floor causes uneven joints and rocking slabs. Forklift drivers experience jolts, and bumps, and lose product, which in turn costs the company money. Seneca Rocks Discovery Center, the visitor’s center for the eastern U.S.’s most popular rock-climbing destination, had a problem common to concrete slab foundations: erosion beneath the slabs caused voids that left areas of the center with uneven spots—some up to thee inches—and created tripping dangers for the thousands of visitors to one of the most popular scenic attractions in West Virginia. Any solution had to be quick, clean, affordable, and not cause inconvenience for the thousands of visitors to the U.S. Forestry Service building. 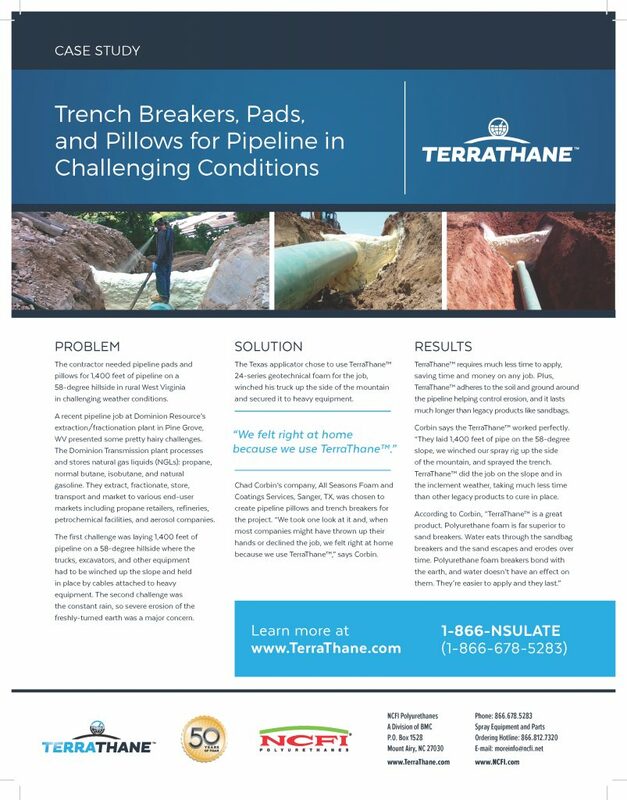 The contractor needed pipeline pads and pillows for 1,400 feet of pipeline on a 58-degree hillside in rural West Virginia in challenging weather conditions. A recent pipeline job at Dominion Resource’s extraction/fractionation plant in Pine Grove, WV presented some pretty hairy challenges. The Dominion Transmission plant processes and stores natural gas liquids (NGLs): propane, normal butane, isobutane, and natural gasoline. 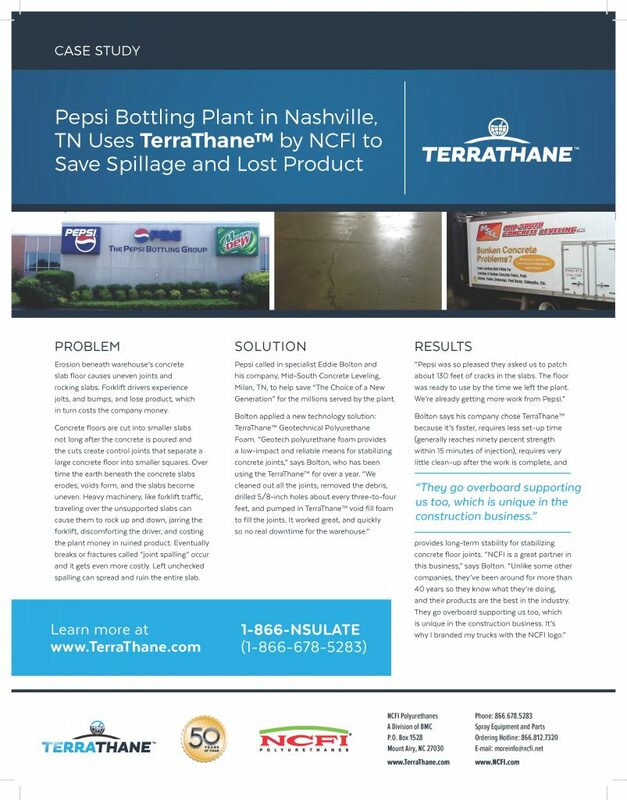 They extract, fractionate, store, transport and market to various end-user markets including propane retailers, refineries, petrochemical facilities, and aerosol companies. The first challenge was laying 1,400 feet of pipeline on a 58-degree hillside where the trucks, excavators, and other equipment had to be winched up the slope and held in place by cables attached to heavy equipment. The second challenge was the constant rain, so severe erosion of the freshly-turned earth was a major concern.